Pittsburgh — Pennsylvania may not be perfect, but it’s a lot better off than it was when Ed Rendell left office. That was the message from Tom Corbett and supporters as the Governor officially kicked off his bid for re-election Wednesday. Corbett, along with his wife Sue, Lieutenant Governor Jim Cawley and other supporters hammered home the dual themes of ‘promises kept’ and ‘mess inherited’ throughout the hour-long program. “In 8 short years, we went from a budget surplus to a budget deficit of $4.2 billion dollars. No sooner did Tom and I lower our right hand on election than in our left hand we were being handed that bill for $4.2 billion dollars,” Cawley said. Despite that tough start, Corbett said, his administration made tough choices that put the state on a course for future prosperity. He ticked off a list of accomplishments, starting with an on-time budget that eliminated the deficit in the state’s operating budget without raising taxes. Several times he boasted that the state added 141,000 private sector jobs since he took office. The Governor took the stage at the Heinz History Center facing a potentially historical uphill climb. Though no Pennsylvania governor has ever lost a bid for re-election, polls continually show Corbett with anemic job approval ratings. Head-to-head polls have shown him trailing several of his 8 potential Democratic challengers. Even before Corbett finished his speech this morning, his opponents were assailing his cuts to education, the state’s lackluster job creation and his perceived affinity for Marcellus Shale drilling. 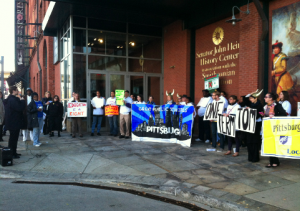 Outside the event, protesters including the Pittsburgh Federation of Teachers jeered. Corbett’s campaign had a message for critics. Lt. Gov. Cawley called out Democrats – and gubernatorial candidate and Congresswoman Allyson Schwartz – by name. He said the Democrats’ energy policies would move Pennsylvania backwards. “They don’t understand how important this industry is. As a matter of fact, they want to kill the goose that lays the golden egg,” he said. He poked fun at Schwartz, who supports a severance tax on gas drilling, and the Pa. Democratic Party, which passed a resolution calling for a moratorium on drilling in the Marcellus shale. “Now folks, help me out here. How do you ban it and tax it at the same time!” Cawley said. But many of Corbett’s recent headaches have come not from the left but from the right. 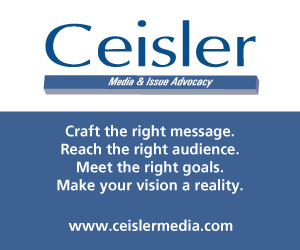 Numerous GOP insiders told PoliticsPA and later the Harrisburg Patriot News that an effort was ongoing to convince the Governor not to seek a second term in light of his poll numbers. He dismissed the rumors on stage. “You know you read stories out there of people being asked questions and everything. Sometimes they forget to ask who the party leader is the party questions,” Corbett said, introducing GOP Chairman Rob Gleason. Several Republican officials cheered Corbett along with roughly 150 attendees, including Majority Leader Mike Turzai, State Sens. Randy Vulakovich and Kim Ward and State Reps. Hal English and Jim Christiana. Corbett said he chose the venue – Pittsburgh’s Heinz History Center – because the late Senator John Heinz originally encouraged him to run for elected office. He departed Pittsburgh this morning and will head to Greensburg and Pittston for speeches later today. Over the next week, he will be on a bus tour of the state that will conclude next Wednesday in Erie, making stops in Hershey, Philadelphia, Allentown, York and among others. I know that some readers are offended that I keep bringing up John Brabender. But the reason is clear: John Brabender is running our state. His influence over Tom Corbett and the PAGOP is overwhelming. COS Gromis-Baker and Mr. Brabender were business partners. And yet we know so absolutely little about our Dark Prince: what he stands for, his business connections across the State, with clients potentially have important business with the State nor his Loundon County, Virginia estate. I know John Brabender and his team have been leaking to the Press for the past 20 years but for the good of PA Voters, shouldn’t we understand what our real Governor is all about? Put some sunlight on the Dark Prince! I heard State Senator Kim Ward was promised annappointment in Corbett’s administration next term if she endorsed him. Guess her appearance today in Pittsburgh at his reelect launch confirms she is a total sell out phony because Sen Ward is telling EVERYONE in Harrisburg that Corbett is a loser. I see so very little written about our Acting Governor John Brabender. Why? 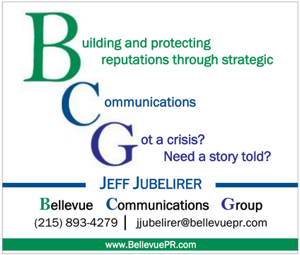 Has he leaked too much information to the Harrisburg Press corps over the years? Doesn’t the root of Tom Corbett’s and Pennsylvania’s problems rest with John Brabender, resident of Loundon County, Virginia? If we only knew ye, our Dark Prince? 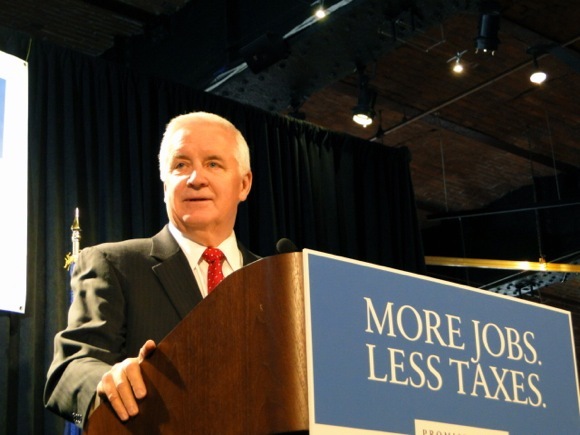 Is Tom Corbett Just Deferring to BrabenderCox on Political Endorsements? Remember when Tom Corbett tried to install his campaign manager Brian Nutt’s dad as head of the Turnpike Commission? That’s just the great kind of friend Tom Corbett is. Gov. Corbett’s preferred candidates for statewide office all have one thing in common. But his picks may not lead the party way. You’ve got Cumberland County District Attorney Dave Freed running for Attorney General with the governor’s blessing. There’s Diane Irey, the preferred candidate for State Treasurer. State Rep. John Maher (R-Allegheny) is the Corbett selection for Auditor General. And, most recently, Corbett has made his pick known for the crowded Republican U.S. Senate race – Chester County entrepreneur Steve Welch. All those listed above are represented by the firm that managed Corbett’s campaign for governor, BrabenderCox. Brian Nutt, a former Corbett aide, and a partner at BrabenderCox, says the governor has endorsed who he thinks best represents the party. LOL at Ed Bradway…whoever that is.